The Polar FS2C heart rate monitor is an updated version of the original Polar FS2. The Polar FS2C uses coded wireless transmission to reduce interference from other heart rate monitor users exercising in close proximity, whereas FS2 doesn't. In other respects the two models are the same. So if you are wondering what the difference is between the Polar FS2C and FS2, coded transmission is the answer. The Polar FS2C is fairly basic. 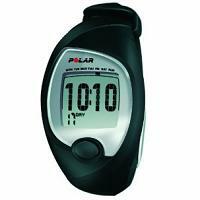 It is part of the Polar fitness monitor series (F- and FS- series) for general use and fitness training. The features in bold are found in FS2C but not in FS1. The FS2C has much the features expected of a basic heart rate monitor. Polar FS1 and FS2 are otherwise identical. The Polar FS2C heart rate monitor is basic (but popular) and aims at the same set of users as FS1 does i.e. those new to heart rate monitoring or those wanting something simple. This takes you to Amazon for some of the best selections for this model. Certain selections come with FREE Super Saver Shipping. Reviews: This page has a concise summary of Polar heart rate monitor reviews. Further information: Visit Polar's official web site. The next one up in the series of Polar fitness monitors is the Polar FS3C. It has ONE additional feature on top of FS2C. Not sure which heart rate monitor is right for you? Take a look at the Which Heart Rate Monitor page.